8"x10" Solid wood plaque in beautiful, high gloss rosewood finish. 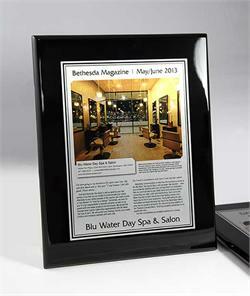 Personalized with your own printed message, company logo and photos. NO SETUP CHARGES. 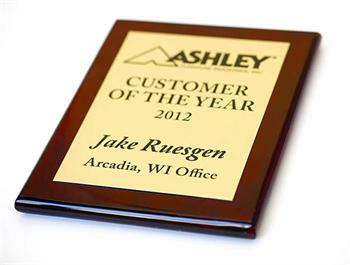 Quality materials for the perfect recognition plaque or office award. Rich black on gold aluminum plate. Quantity discounts available on this page. No setup charges for adding your corporate logo, photo recognition or any custom text and layout. 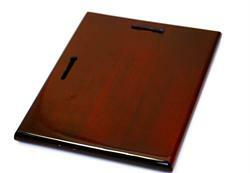 Note that keyhole mounting by screw or nail is made possible with pre-drilled openings on the back of each plaque. Mounting hardware is not provided. Add Custom Text Here - Please use a "/" mark to indicate line breaks. Solid wood plaque in black piano gloss finish. Personalized brushed metal plate with your own message, logos or photos to create your perfect plaque or office rocognition award. Free custom messages and photos. No setup fees.